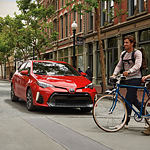 The Toyota Corolla is one of the top vehicles available in the compact class thanks to its reliability and safety. However, many drivers remark that the new designs are a fresh take on the classic affordable sedan, making it larger and yet still fuel efficient. In addition, there are multiple new trims, including the stylish Corolla Hatchback XSE and XSE CVT. The Corolla Hatchback models caused quite a stir at the unveiling in 2018, and with EPA estimates of 38 mpg for the highway, it’s always a pleasure to get behind the wheel of a car that lets you zip around town without burning through all of your gas. The fresh headlamp and fog lamp designs also make it a top choice for those who require their vehicle to be modern and stylish. Want to see the latest Corolla trims? You can stop by Liberty Toyota located in Burlington for more information and talk with a friendly customer service team.